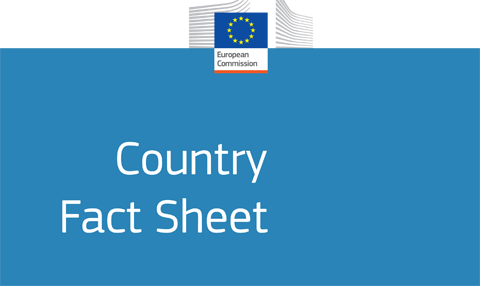 The Analysis unit of DG for Regional Policy has updated the 28 country fact sheets created to support the preparation and negotiations for the programming period 2014-2020. Each factsheet makes it easy to compare the performance of a country with the EU average and the best and the worst performer in the Union. It shows indicators at the national level, grouped by the three types of growth, and the regional level. In addition, it shows the distribution of population by type of region and a few indicators by degree of urbanisation, which highlight the differences between cities and rural areas. The Europe 2020 indicators are highlighted in blue. They show the current level, the target, the distance to the target and recent change. The distance to target shows how far a country is removed from the target it has set itself. This distance can be compared to the EU distance and the shortest and longest national distance. Comparing the distances should provide an indication of the relative effort required to reach the target. Where available and reliable, regional Europe 2020 indicators have been included.